Posted by V the K at 1:40 pm - November 12, 2016. BTW: I’m just going to leave this comment here. Wonder if it’s still valid. Whoever wins, let’s get behind them to make America great! BTW: The spin from Clintonville is that she lost because the media was too Pro-Trump and Anti-Hillary. And some people say the Democrats are out-of-touch and detached from reality. Posted by V the K at 9:53 am - November 12, 2016. 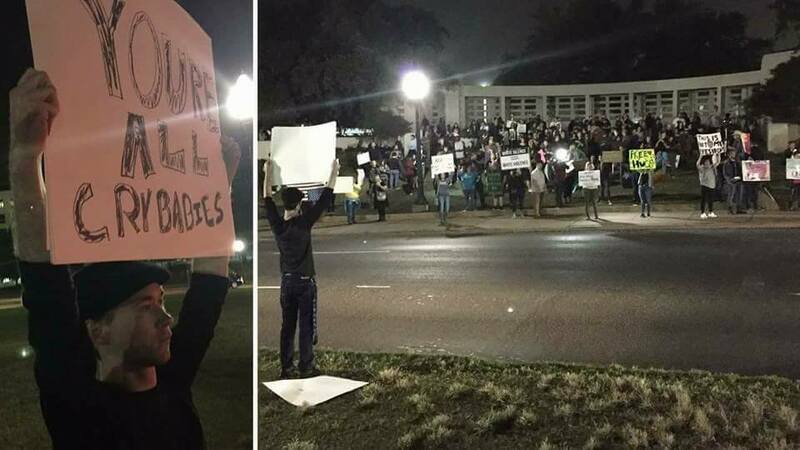 A counter-protester in Dallas TX stands up to a gang of fascist crybullies seeking to shut down a nascent populist movement. 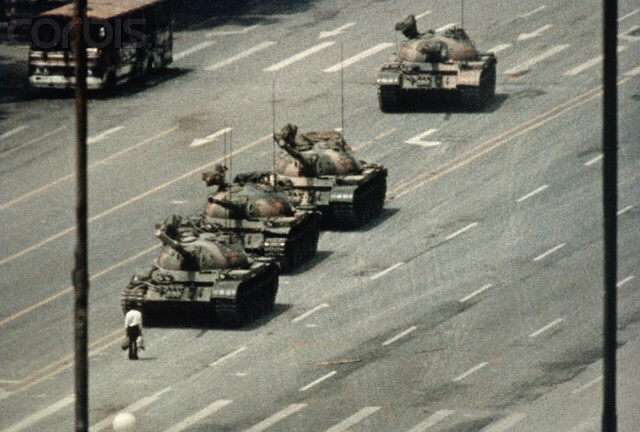 It takes courage for one man to stand up against the brownshirt bully enforcers of a corrupt, oppressive Government of oligarchs, cronies, and power-mad party bureaucrats. Posted by Jeff (ILoveCapitalism) at 5:59 am - November 12, 2016. Ronald Reagan was the last Republican president who was swept into office promising great change. He made good on his “Morning in America” promises to cut taxes and regulations. But he failed in his promises to reduce spending. …[and now after others did even worse,] the economy of 2016 has far deeper problems than the economy of 1980. Reagan’s morning now looks more like Trump’s midnight. …as bleak as the picture Trump painted of the current state of the U.S. economy, it was not bleak enough. Before things can actually get better, they must first be allowed to get much worse. Decades of government promises to supply voters with benefits taxpayers can’t afford must be broken, starting with many of the promises Trump made himself to get elected. (Emphasis added) That has been my chief criticism of Romney (in 2012) and of Trump all along: Although they were “truthier” with the voters than their Democratic opponents, they still didn’t tell voters nearly enough of the truth. After eight years of President Obama, we now have a national debt of $19.8 trillion by official figures; and something far north of $100 trillion when you include the “unfunded liabilities” (the future benefits promises that the government should report, under proper accounting standards – and does not). States, and especially their pension funds, also face a great crisis where they won’t come close to meeting their future promises. This is all very different from when Reagan took office. Based on his speeches about “infrastructure” spending and his past track record, Trump’s first instinct might be to run up the U.S. debt up to even greater heights than Obama has. But at some point, Trump’s deficit spending will hit a wall: a full-on recession (it’s overdue) and a new financial crisis, wherein world markets simply won’t allow the United States to carry on as before. What happens then? Will Trump give Americans the bad news about serious cuts to their benefits and hopes? Or will Trump flounder, protect special interests – maybe hyperinflate the dollar – and allow events to destroy him and us? Anyway, it’s been fun to watch the left-wing butthurt over President-Elect Trump these last few days; but realism compels me to start being a wet blanket again. America’s problems, especially its debt problems, are beyond anything that even Trump had acknowledged. He won’t be able to fix them by magic. And in a way, left-liberals are right: the next four years will be awful, for many.